Which side is more delicious? The chocolate with white chocolate chips? Or the traditional chocolate chip side? Life is too short for just one kind of cookie. Combine two cookie doughs that take about the same amount of time to bake and you have a recipe for a cookie which will disappear in the blink of an eye! These cookies were as fun to make as they were to eat… play dough for a baker! Make the chocolate chip dough. In a large bowl, mix together butter, sugars, egg and vanilla. Thoroughly mix the flour mixture into the butter mixture. Fold chocolate chips into dough. Turn dough out onto piece of plastic wrap. Cover tightly and refrigerate for at least 2 hours. Make the white chocolate chip chocolate dough. In a medium bowl, whisk together flour, cocoa, baking soda and salt. Fold white chocolate chips into dough. Take a tablespoon of the light dough and roll into a ball. Take a tablespoon of the chocolate dough and roll into a ball. 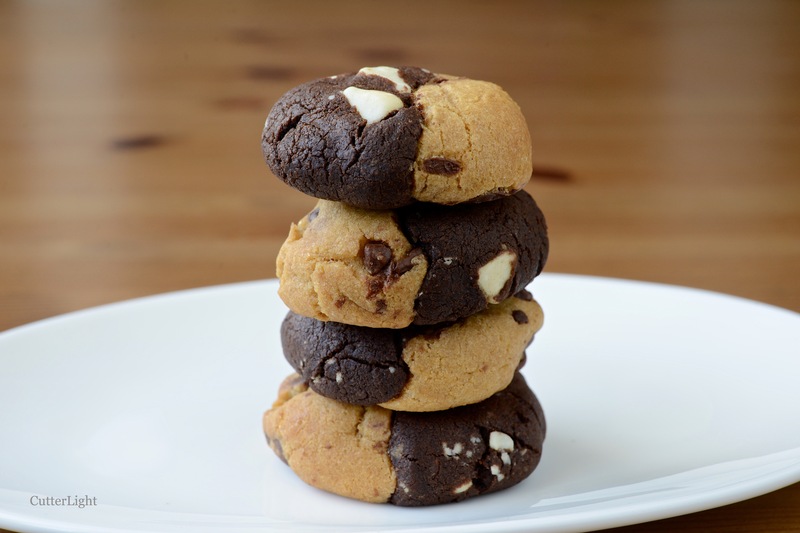 Cut each ball in half and press the opposite doughs together, so you have a ball of half chocolate chip dough and half white chocolate chip dough. Press the balls slightly and place on prepared baking sheet. Repeat process until the baking sheet is filled. I fit 20 cookies on a sheet. Bake cookies for about 10 minutes. I like mine soft, so they will appear slightly underdone at 10 minutes. Bake a couple of minutes longer for a crunchier cookie.